Styrene-acrylonitrile (SAN) resins are optically clear resins used in a variety of end uses including housewares/consumer goods, various compounded products, packaging, appliances (electrical/electronic), medical applications, and certain automotive applications. In these markets, SAN is used for its rigidity, clarity (although various compounded grades are translucent/opaque), excellent gloss, heat resistance, good processability, load-bearing strength, and resistance to chemicals. Acrylics, polystyrene, polycarbonate, polyvinyl chloride (PVC), and clear ABS are among SAN resins’ main competitors. SAN resin production for ABS and weatherable polymers is not covered in this report, nor is captive use of styrene and acrylonitrile for SAN-type polymeric polyols. SAN markets have continued to move to Asia, as the manufacturing industries that consume SAN (electronics, housewares, appliances) shift to the region. China alone accounted for about half of global consumption in 2017. Northeast Asia is the largest producer and consumer of SAN resins, led by China; production in the other Northeast Asian countries (Japan, South Korea, and Taiwan) is largely for the export market, primarily to China. 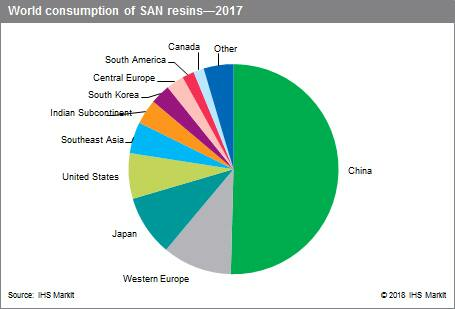 China accounted for about half of global SAN resin consumption and trade in 2017 and will continue to drive the SAN market during 2017–22. The major consumers of SAN resins are China, Western Europe, Japan, and the United States. These four countries/regions together accounted for more than three-fourths of total global SAN consumption in 2017. China uses most of its SAN resin in electrical and electronic applications. Electrical and electronic applications are also the largest market for SAN resins in Western Europe. In the United States, the houseware segment is the largest, while in Japan, most SAN resins are used in compounding applications. China is the only country in Northeast Asia expected to see consumption growth for SAN resins in the next five years; consumption in Japan, South Korea, and Taiwan is expected to decline because of continued competition from other materials and decreasing demand in the domestic electrical/electronic and housewares industries. SAN production in these countries will also decline; the global export market is expected to shrink as China and other countries in Asia become more self-sufficient. Consumption of SAN resins in the United States and Western Europe will grow at a lower rate than the global growth rate, representative of their mature demand. Developing countries, such as India, will have the highest SAN resin consumption growth rates during the next five years. SAN consumption is forecast to grow at an average annual rate of 1.6% during 2017–22, lower than the 2.4% annual growth in 2012–17. World growth in SAN consumption will be driven by applications in housewares/consumer goods, electrical appliances and electronics, compounding materials, and medical uses.